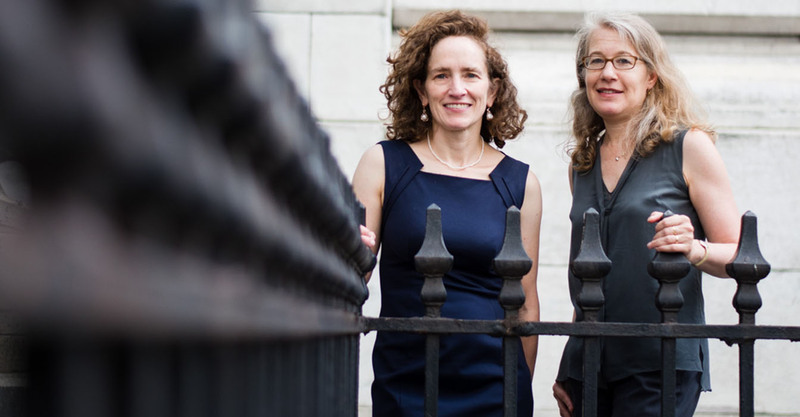 Photo of Alexandra Shapiro (left) and Cynthia Arato by Laura Barisonzi. Keeping up with law school classmates can pay dividends in ways you can’t always predict. Columbia Law ’91 graduates Alexandra A.E. Shapiro and Cynthia S. Arato were not close friends as students, but the occasional hangout while partners at different firms led to a realization that perhaps they should form their own litigation boutique. That happened in January 2009. Shapiro, a former federal prosecutor in Manhattan who left Latham & Watkins, handles a mix of civil and criminal work, with an impressive record of obtaining reversals of criminal convictions on appeal. Arato, who left Gibson Dunn, specializes in intellectual property litigation for both companies and individuals in the entertainment and media arenas, as well as in other industries. Their practices complement each other, not least because each likes to dabble in law outside their own substantive focus and collaborate on case preparation. They expect Shapiro Arato to expand its range of litigation work in the years ahead. Lawdragon: I assume your relationship started at law school. How did you stay in touch over the years and develop the idea of possibly starting your own firm? Alexandra A.E. Shapiro: We crossed paths in law school but didn’t connect again until many years later when we were both partners at large firms. We began having occasional lunches and sharing information about our careers and experiences. I was approached by one of our firm’s original founding partners about starting a boutique litigation firm and became seriously interested when I learned that Cynthia was involved. As we discussed starting our own firm, it became clear that we shared the same goals and sensibilities. Cynthia S. Arato: Alexandra and I had mutual friends while at Columbia Law School, and they kept me up to date on her career moves. We reconnected after I moved back to New York and we were both in private practice. We made a point to meet for lunch from time and time, and we would talk about our long-term goals. We didn’t talk specifically about starting a small firm, but once I began thinking about doing that, Alexandra was a natural fit. LD: Can each of your share a key motivating factor in making the move when you did? CSA: I had reached a point at Gibson Dunn where my billing rate was beginning to limit my ability to attract and retain clients in the entertainment industry. It didn’t make sense for a lot of artists and entertainment companies to hire a partner from a large law firm to handle many of their matters. I had a great experience at Gibson, but I have always enjoyed working with artists and entertainment clients and wanted to have the flexibility to accommodate their needs. AAES: I also found myself constrained by the realities of working at a big law firm. Latham & Watkins’ popularity with large institutional clients meant that I sometimes missed out on opportunities to represent individuals, especially with respect to white collar and appellate work. I was also closing in on a decade of practice in a large law firm environment and was ready to take the next step towards a new challenge. I felt it was time to chart my own course and focus on the work that most appealed to me. LD: Looking back over the seven years, is there anything about the process that has surprised you? Or is there one piece of advice that you definitely would give anyone considering launching a boutique? AAES: All things considered we had a very smooth start. We were busy with client work from day one. That was challenging because it took some time to hire qualified associates, and we had to make do with temporary attorney assistance for several months. Also, we had to balance our client work with setting up an IT framework, accounting systems, and employee benefit plans and the like. I would say that it is important for anyone launching their own firm to do as much of that legwork in advance as possible, including identifying reliable vendors. CSA: I had spent most of career at boutique law firms, so I didn’t have any surprises. I had a number of cases for long-standing clients in the music industry that I continued to handle when we opened our doors and that helped give us stability from day one. I would advise anyone who can to start with an anchor client or two. Our first hire was a part-time office manager and not an associate. That allowed us to focus more of our energies on building our practices and on our cases. It was more valuable to have help with all of the non-legal work, which is especially heavy when you are starting a new firm, than it was to hire lawyers. LD: As anyone who has run a small business knows, hiring the wrong person can cause a number of problems and waste a lot of time. What have you looked for in lawyers and other staff that have joined the firm? AAES: Hiring exceptional talent is essential when working with a small team. Beyond the obvious like analytical abilities and strong writing skills, we look for people who take ownership of their work, since our matters are staffed leanly without the buffer of layers of lawyers. Clerkship experience is also invaluable, even though it sometimes means that it takes longer than we would like before an associate can start. We find it is worth the wait. CSA: It is important to hire people who want to work in a small firm environment. People who prefer working on large teams or are drawn to the amenities of a BigLaw firm – like a dedicated, 24-hour word processing department – may not be the best fit. But self-starters who relish taking the lead on projects early on tend to be happier and their talents will shine. LD: You have different types of litigation practices. Does the mix of work the firm handles always flow from each of your core areas? Have you expanded to, or have you thought about expanding to, a different type of litigation area that you do not typically focus on? CSA: A lot of my work is in my sweet spot of intellectual property litigation for media and entertainment clients. That work has expanded to include non-IP work for these same clients, as well as IP work for clients in other industries, including banks and technology start-ups. Both Alexandra and I think of ourselves as litigators first, and subject matter specialists second, so we both relish working on complex matters, including outside our core areas of expertise. I recently handled a matter involving the intricacies of federal drug testing laws and Alexandra has been spearheading a challenge to the Federal Election Commission’s rules regarding the presidential election debates. AAES: Because of my appellate expertise I am most often retained when another firm has lost at trial, but I also handle investigations and complex civil and criminal litigation at the trial court level. Going forward we would like to take on even more of those commercial matters, especially in the financial arena, as well as more white-collar work. Also, we have recently been doing more Supreme Court work and hope to expand our Supreme Court practice going forward. LD: Given that you work on different types of cases, do you still collaborate? Are there ways in which you work together on litigation aside from management issues? CSA: We have expertise in different substantive areas and that was one of the key factors in our choice to partner in this venture. We respect each other’s instincts and intellect. We often pop into the other’s office to talk about case strategy or a particularly thorny issue. Alexandra and I moot each other for our appellate arguments. And we each have taken the lead in select issues in the other’s cases. I recently helped negotiate a trademark license for one of Alexandra’s clients, and she advised some of my clients when they received subpoenas in government investigations. LD: Can you discuss your fee arrangements when talking work and what role this played in building the practice? AAES: Our fee arrangements vary according to the needs of our clients, from hourly billing to contingency arrangements to alternate fees. Tailoring our rates has allowed us to set our own agenda and build a practice around cases that are cutting edge and of interest to us on the merits. We have no rigid fee structures that would limit our ability to pursue the work that we find most rewarding. LD: You’ve both worked on some high-profile matters recently. What will be keeping you busy in the year ahead? AAES: In October, I will be arguing before the U.S. Supreme Court in U.S. v. Salman, which raises an important question on the scope of insider-trading liability. In addition, I am representing Dean Skelos, the former New York State Senate Majority Leader, in his pending 2nd Circuit appeal of his conviction on federal public corruption charges. Also, the second phase of my work as independent consultant for the New York Stock Exchange pursuant to an appointment arising from an SEC settlement is just beginning. CSA: I am working on an infringement case regarding the novel issue about the depiction of graffiti art located on public city streets. I am also continuing to oversee international litigation for the J.D. Salinger Literary Trust and we anticipate a trial in 2017 regarding copyright protection abroad for works that have entered the public domain in the United States.